Mark Jankowski, the first scholastic player selected at the 2012 NHL Draft, has elected to continue his career at Providence College in the fall. Jankowski, a center taken by the Calgary Flames with the 21st pick, intended to play for the Dubuque Fighting Saints of the United States Hockey League for one season before joining the Friars in the fall of 2013. "Although we are disappointed in not having the opportunity to work with Mark, we wish him the best of luck in Providence as he continues his student athletic career," Dubuque coach and general manager Jim Montgomery said. "Mark is a good kid from a great family and would have fit in nicely with our culture." Providence, which has not qualified for the NCAA tournament since 2001, plays in the ultra-competitive Hockey East conference. Second-year coach Nate Leaman said at the draft he felt Jankowski was ready to make the transition to top-line center at Providence immediately. "I think I'm ready to step in, play a role and help Coach Leaman and his program win a national championship -- that's the goal," Jankowski told the Flames' website. "I'm ready to step in and do that." The school was holding a scholarship for him in case he did decide to attend Providence this season. "I think he sees the ice and skates very well and the only real need of improvement is his weight," Leaman told reporters after the draft. "The one thing I like about Mark is that he makes players around him better. I first saw him when I was a coach at Union [College] and about three months later, when I took the position at Providence [April 22, 2011], I really started tracking and watching him." Jankowski said the ability to train and play influenced his decision. "The schedule is a little more condensed so that gives me a lot more time for weight training and getting into the gym," the 6-foot-3, 168-pound player said. "It's really important, it's what I need to work on: getting bigger and stronger." The 17-year-old generated plenty of interest at the draft despite the fact he was playing for Stanstead College, a prep school in Quebec's Eastern Townships, the past two seasons. Stanstead may not be the typical breeding ground for future NHL stars, but in the case of Jankowski, the Flames felt the 6-foot-2 standout was too good to pass up. He had 53 goals and 93 points with a plus-51 rating in 57 games last season, which followed a rookie season that saw him total 36 goals and 82 points in 65 games. His rise as a prospect, according to scouts, was his incredible skill set and a growth spurt that saw him go from 5-foot-8 to 6-foot-3 in a span of 18 months. "His skill set, hands, vision and skating are really good," Flames director of amateur scouting Tod Button told NHL.com. "We couldn't find a flaw in him except inexperience and the level of competition. We can only judge guys by where they play, right? We liked everything about him and we think he has a real high ceiling to be a real good NHL player." Jankowski recently attended Calgary's development camp at WinSport's Athletic and Ice Complex. "A great moment for me … putting on a Flames jersey, it's exhilarating," Jankowski told the Calgary Herald after the first day of camp. "There were a little bit of nerves, but I just tried to relax and play hockey like I've always done. I just want to go as hard as I can and prove that I can compete out here with some of the best players, some of the best prospects, in this organization." Button explained the organization is going to be very patient with Jankowski. He's also certain it will be worth the wait. "I break it down by the individual skills and how I think they would translate to the NHL," Button said. "I think that's the first thing I start with any player … does he have translatable skills? With Jankowski, and with any young player out of high school, it's important that you have experience on your staff. People have gone through and seen a cycle of the Brian Leetches and other prep school kids, the guys who have seen T.J. Oshie … those guys have a reference point." Jankowski was No. 43 among North American skaters on NHL Central Scouting's final draft rankings. According to Jankowski, the NHL player he most likely would be compared to is David Krejci of the Boston Bruins. "We have that reference point and that makes it easier to take a guy like Mark Jankowski, who is playing at a lower level but who, we feel, will transfer those skills to the NHL," Button said. "[Flames assistant general manager] John Weisbrod came through the prep school system and he played against Leetch, so he's a great guy for a reference point." 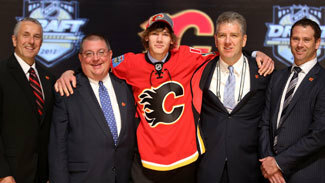 Jankowski wasn't the only 2012 draft pick chosen by the Flames slated to join the Friars in the fall. Goalie Jon Gillies, a third-round pick, is coming off a solid season with the Indiana Ice of the USHL, going 31-11-9 with a 2.77 goals-against average and .915 save percentage. He also will participate in USA Hockey's National Junior Evaluation Camp next month in Lake Placid, N.Y.